Or felt sick and gone to the doctor, whereupon the cough/rash/bleeding (insert formerly serious problem here) disappeared between settling the co-pay and entering the doctor’s office. (Residents of countries with universal health care programs can disregard the co-pay step). This is how it went on Sunday. The Oscar for best actress in a starring role of confident, socially-adaptable, well-behaved Great Dane puppy goes to……Luna. I saw it coming a mile away. Even opined about it, like pro sports draft experts. Luna had been showing signs of rebellious adolescence. (Ed. Note: Is there any other kind?) Bouts of unexplained silliness. Pretty much what you would expect from a 6-month-old puppy, but they unnerved MW. MW had even scheduled a $175 behavioral assessment this week. I insisted that we first visit Luna’s breeder to get an independent opinion. Independence in the dog behavioral business seems hard to find. It’s kind of like asking Shire Pharmaceuticals (makers of Adderall XR) whether the medical profession should lower the symptom threshold for attention-deficit hyperactivity disorder (ADHD) diagnosis. So off we went to visit B2 for Luna’s psychological and behavioral pre-assessment on Sunday. We drove 90 min. to B2’s house. She came out and took Luna for a short walk, while MW and I peered after them from afar. It was like watching your five-year-old in a kindergarten production of the Jungle Book and wondering what might go awry. Nothing did. Luna displayed almost exemplary behavior. Next we drove over to a local mall for some socialization evaluation. This means sitting outside a coffee shop with your dog and anxiously hoping he/she doesn’t nip or bite a passerby. We chose a Peet’s Coffee Shop (a California-based coffee shop chain like Starbuck’s for those who don’t know it), and sat in the sunshine amidst the mid-morning crowd of loud talkers and lycra-clad cyclists. Luna stood peacefully, played confidently with a designer dog that came over to introduce herself, and wasn’t miffed at all when several coffee drinkers asked us if she was a Marmaduke dog. We walked Luna around the mall, and gave some dog treats to kids so they could feed her. We even sat next to the Bellagio-worthy fountain that coordinates water eruptions with the music beats coming from the outdoor speakers. Luna was a star. We left an hour later. The final stop was a local dog park offering some large and temporary playmates. 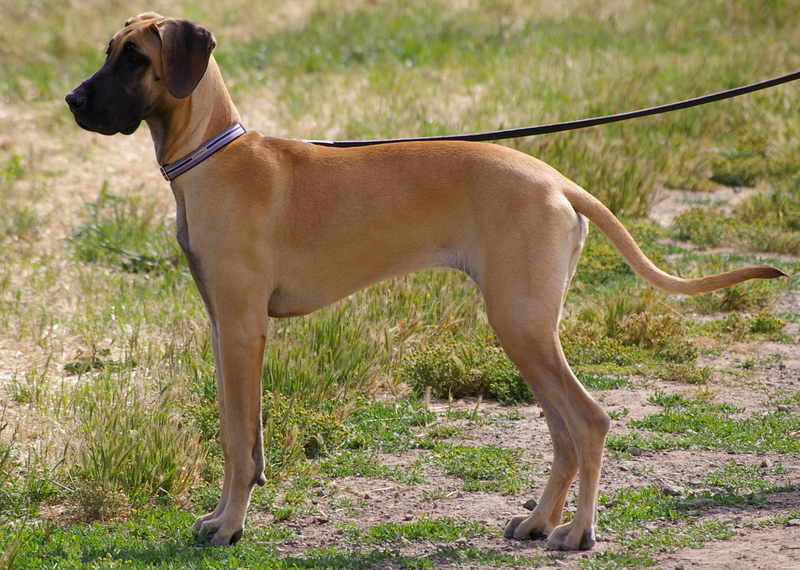 Among them were two adult Great Danes, and a strange Great Dane/Labrador mix that was black and gangly with almost every angle and measurement out of proportion. There was also a surprisingly agile 3-legged shepherd. Three different “tests” and each a high passing grade for Luna. Luna had no trouble or any moments worthy of a $175 intervention. It must have been tough for MW. A less charitable breeder than B2 might have concluded that MW was fibbing and wasting her time. Instead, Luna came off as if dog whisperer Cesar Millan had personally trained her. We drove home $175 richer.